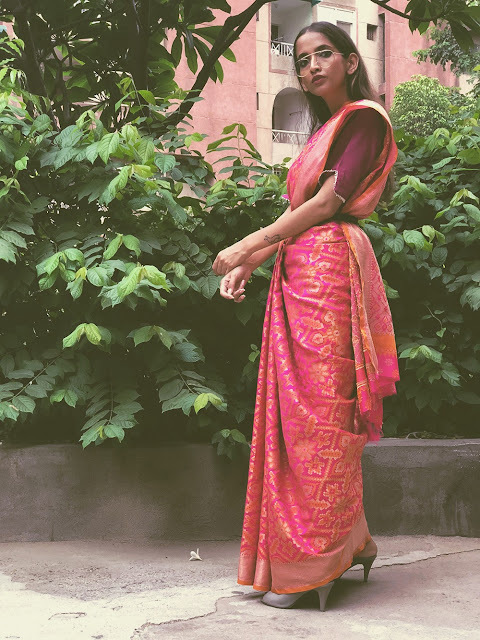 Believe it or not, but August has been all about sarees for me, from talking about the revival of silk sarees to attending a couple of weddings wearing one! Also that now I am getting married I have been on a shopping spree to add more of these in my trousseau. So when I heard about Craftsvilla's #MySareeMyStory campaign and the whole idea behind it I knew I had to be a part of it. I have always been very vocal about my love for sarees! And despite being extremely skinny nothing has ever deterred me from trying out different fabrics. While I chose a Kanjeevaram Silk saree for my last post, here I am seen wearing this beautiful fuchsia pink Patola Silk saree from Craftsvilla. This fabric is thicker but I made sure I style it in a way that it compliments my body type. And to make this post is little different from the others I decided to change few elements here and there to create four looks out of one. 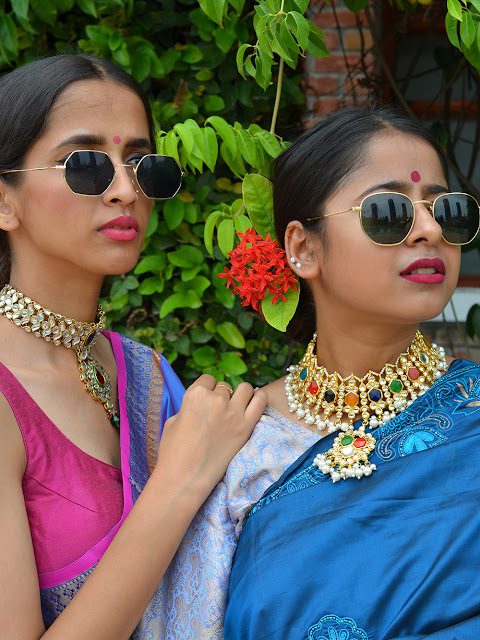 This blog post is really close to our hearts as a lot of efforts has been put into creating this, not that we don't do the same for our other looks but we planned this one extensively right from deciding on the sarees & location to shooting and editing a teaser ! Talking about the revival of silk sarees, well we both personally have immense love for this fabric but unfortunately, we don't see a lot of our peers sporting one. Not saying that it dying but maybe it doesn't fall into the 'fashionable' criteria of our fashion enthusiasts. Nevertheless, in my opinion, it's one of the most magnificent fabric and doesn't require much of accessorizing to lift up your look. I would any day prefer wearing this to a wedding over whatever trendy.